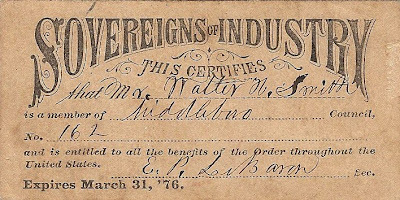 The Sovereigns of Industry was a reform movement which sought to encourage consumer cooperatives and "the purchasing of all goods used by families at producers' prices". Established in Massachusetts in 1874, it flourished briefly, principally in New England and the eastern states. The organization of the Sovereigns of Industry was modeled upon that of the Grange which in 1873 began operating cooperative stores for its members, and it was heavily influenced by the Rochdale Society of Equitable Pioneers in England, as well. At the height of its popularity, the Sovereigns of Industry had over 250 councils in New England, each of which operated a cooperative store. Essentially the stores sold goods at market prices. Profits were returned in the form of dividends to shareholders as well as to purchasers in proportion to the amount of goods which they purchased. The avowed goal of the Sovereigns was the promotion of "mutual fellowship and cooperative action among the producers and consumers of wealth throughout the earth....We mean to substitute cooperation, production and exchange, for the present competitive system.... We war with the whole wage system and demand for labor the entire result of its beneficial toil." Most at the time found these goals too radical and the organization consequently suffered from this characterization. Middleboro Council No. 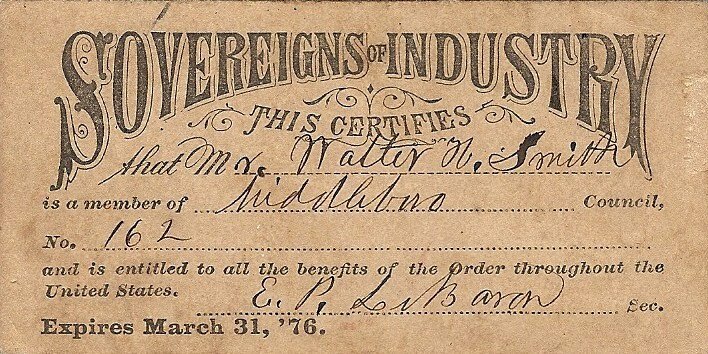 162, Sovereigns of Industry, was formed either in late 1875 or early 1876. In January, 1876, the organization was meeting in the Town Hall and just a month later hired Assawamsett Hall for their headquarters. Unfortunately, little is known of the local organization or its membership. Certainly by 1879 it was defunct along with the national organization whose stores were unable to weather political opposition and the straitened economic circumstances of the mid and late 1870s. "Like many other associations, this of the Sovereigns had grown too fast and been joined by too many ignorant, discordant elements to bear the shock of adversity. The severa and long-continued hard times, from 1874 to 1879, began to tell upon the order" [Bemis:43]. Walter H. Smith whose membership card appears above was a carpenter who, in 1879, was residing on Wood Street in Middleboro. Eugene P. LeBaron, who signed the card as secretary of the local council, was associated with the LeBaron Foundry on Vine Street. Bemis, Edward W. History of Coöperation in New England. Baltimore: Publication Agency of the Johns Hopkins University, 1888. Curl, John. History of Work Cooperation in America. Berkeley, CA: Homeward Press, 1980. Leikin, Steve, "The Citizen Producer: The Rise and Fall of Working-Class Cooperatives in the United States" from Ellen Furlough and Carl Strikwerda, eds., Consumers Against Capitalism: Consumer Cooperation in Europe and North America, 1840-1990. Lanham, MD: Rowman and Littlefield, 1999. Middleboro Gazette, "What the Gazette Was Saying Fifty Years Ago", January 8, 1926, p. 3; "What the Gazette Was Saying Fifty-Five Years Ago", January 2, 1931, p. 6, and February 20, 1931, p. 7. New York Times, "The Sovereigns of Industry", March 6, 1874.